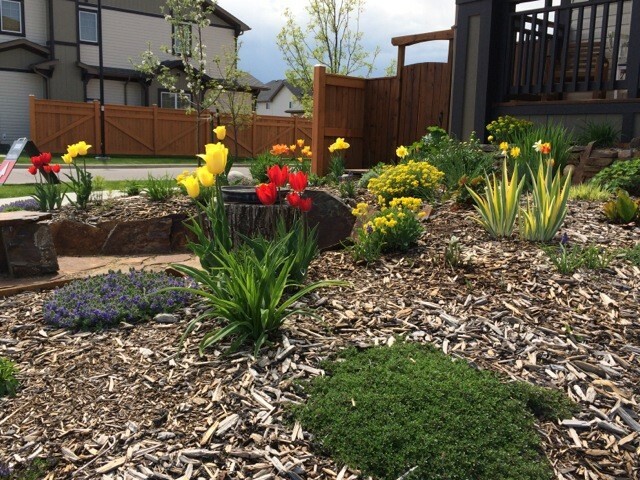 Mulch is a layer of material applied on top of the soil layer. In this post we are referring to bark mulch, but other natural materials can also be used as mulch. It has been said that mulch “covers a multitude of ills” and can make any yard look good. More important than aesthetic appeal is the fact that mulch benefits your plants in so many ways. It insulates against heat and cold. In the winter mulch keeps the ground ‘wet frozen’ preventing the ‘dry frozen’ that often happens with chinooks and kills plants. It retains moisture in the soil around plant roots and reduces the need for watering. Mulch keeps the soil where it belongs, especially in our strong winds. As bark mulch breaks down over time, it adds organic matter to the soil, helping to rebuild beneficial soil microbes that feed our plants. When applying mulch to the garden, use at least 2 to 4 inches. A mulch layer of 4 inches in depth prevents weed seeds from germinating and growing. If they do happen to sprout and grow within the mulch layer they are easy to pull out. Note: existing crabgrass and deep rooted weeds will only be slowed down by a deep mulch layer. 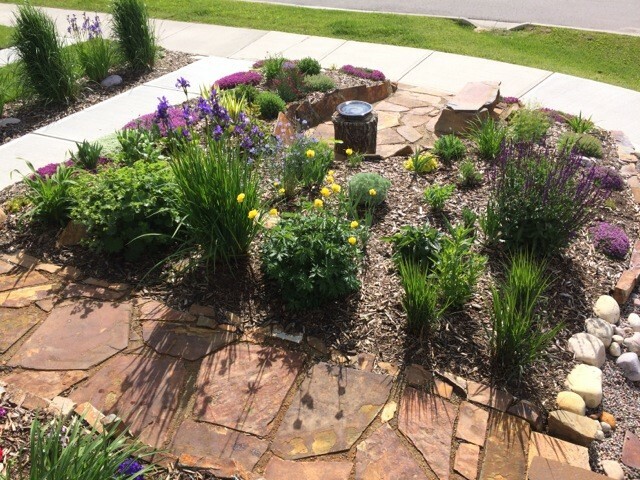 Dig out all the roots of any grasses or weeds that you want rid of for good before mulching. When using mulch around trees and shrubs, make sure that the mulch is not in contact with the trunk. Just pull it away in the spring leaving a small well around the trunk. This helps prevent insect problems and disease. Bark mulch is a natural material that promotes a zero waste practise. It looks nice, smells nice and is available in many sizes, types and colours. A top layer can be added every year for a fresh look and extra insulation. 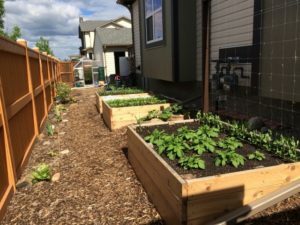 For our corner lot in Heartland we chose to have no grass at all in our yard and instead we used mulch liberally for pathways, around veggie boxes and in all of our perennial, shrub and herb beds. Over three gardening seasons we purchased 8 &1/2 cubic yards of Parkland Premium Plus mulch from Top Spray. Most of it is still in place and we will likely add a top layer again this year.